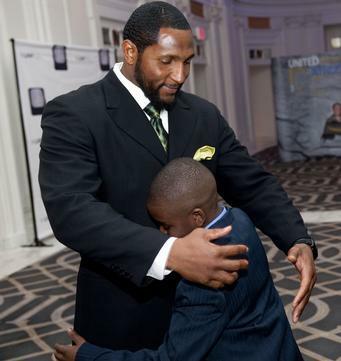 LaShaun Armstrong gets a hug from Baltimore Ravens linebacker Ray Lewis during the United Athletes Foundation Gala Saturday, April 30, 2011 in New York. *Baltimore Ravens Pro-Bowl linebacker Ray Lewis and former NFL cornerback Reggie Howard are spearheading an effort to provide humanitarian and emotional assistance to the 10-year-old New York boy who was the lone survivor after his mother drove a van carrying him, his brothers and his sister, into the Hudson River on April 12. On April 30, Lewis and Howard each donated $10,000 to a relief fund at a Manhattan fund-raiser that will provide La’Shaun Armstrong with counseling and tutoring sponsored by the United Athletes Foundation. Armstrong’s mother, Lashanda, drowned, along with three of her other children. Authorities believe the woman drove the vehicle into the river following an argument with her boyfriend. La’Shaun Armstrong survived by climbing out of a window and was rescued by a passing driver. Lewis told reporters that he reached out to the boy as soon as heard about the tragedy. He says Armstrong needed a strong male influence in his life because his biological father, Todd Johnson, is in prison. Armstrong’s family agreed that the 10-year-old needs help. Armstrong’s uncle, Tymare Armstrong, said the youngster often has trouble sleeping. La’Shaun Armstrong admitted that he was struggling with the tragedy, but thanked the UAF for helping him and his family. The boy now lives with his grandmother. “I’d like to thank the UAF for fund-raising this money for my family and I’d like to thank Ray and Reggie for being there for me and taking care of me when I need help,” the boy said during the event, according to the Post. The fundraiser was a part UAF’s charity weekend co-hosted by Lewis and actress Vivica Fox. The weekend included a father and son bowling tournament, a pro athlete summit on financial reform, and health screenings. Aww that is such a nice heart warming pic. I feel so bad for this young man losing his mother and siblings tragically. I hope Armstrong is receiving all of the help he needs to cope with what happened. God Bless him. This is so heartwarming to see. This is the type of news that needs more attention from the media. Black men taking this young boy under their wing and protecting him. A beautiful thing to see! Sidenote: My heart goes out to this young boy and his family during this time of tragedy. Agreed. You don’t see this in the news much, just the negative attention gets the press. Yes, that photo is so touching and it feels good knowing Ray and those other athletes are stepping up in a major way on the boys behalf. These kind acts must really lift his broken spirit. God bless Ray and co.
It’s wonderful to see a positive story involving NFL players in the news. My heart and prayers go out to LaShaun and his family. I can’t imagine what that must be like. So sad. I’m glad to see Ray and Reggie stepping us to help because they can. This little boy is going to be traumatized for a very long time. I just hope his mother’s mental illness does not affect him as well.